From 3-D Printers To Wired Glasses, The Tech Year Ahead : All Tech Considered It's unlikely 2013 will be the year that jet packs make it big, but the coming year could bring us a host of other new technology trends and products, like 3-D printers for consumers, even smarter smartphones, and more connected devices like glasses and cars. 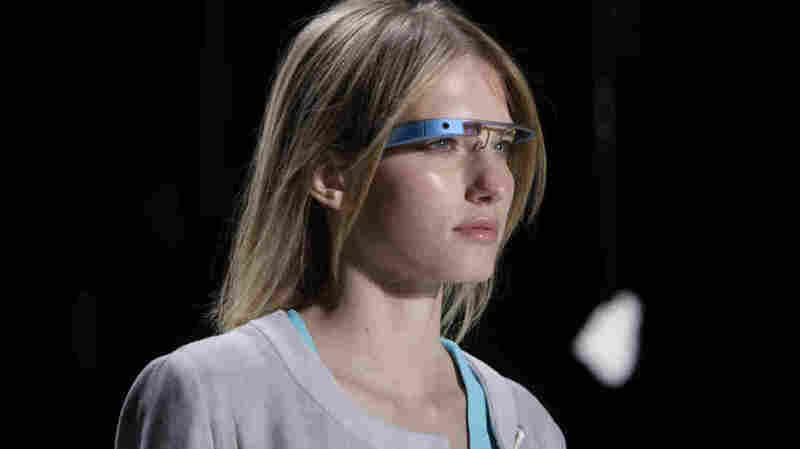 Google Glass will be part of a trend in 2013 of computing and connectivity in devices we don't generally think of as computers. It's unlikely 2013 will be the year that jet packs make it big, but the coming year could bring us a host of other new technology trends and products, such as 3-D printers for consumers, smarter smartphones and more connected devices like glasses and cars. New Game Consoles: We are likely to get new game consoles from Sony and Microsoft. As always, there will be better graphics and very likely 3-D — at least from Sony but probably from both companies. You're also going to see a continuation of the trend of turning these devices into more than just game consoles. They'll turn into home entertainment centers — for example, a console that wirelessly connects to every screen in the house at once. So, you could play games in the den through the console while someone is also using it to watch television in the living room. 3-D Printing: This may be the year we see 3-D printing open up in the consumer market. The printers have been used for a while by industries to make things like airplane parts. But the prices of printers have come down significantly, so people may start having them in their homes to create things like jewelry and toys. Tablets Vs. Laptops: Apple's iPad opened up and dominated the tablet market, but now there's major competition from Google, Amazon and Microsoft. And not only can you play games and watch movies, you can work on these devices now. So tablet sales are probably going to outpace laptops. And speaking of Apple, some analysts say the company will launch some kind of streaming music service to compete with Pandora and Spotify. Smartphones In The Developing World: Prices of tablets and smartphones will continue to go down, and that will inspire some of the most interesting technology trends in the developing world. Right now, the vast majority of phones sold in the developing world are feature phones, but as that begins to change as the price of smartphones goes down, we're going to see millions — and then billions — of people connecting to the Internet. And that gives them access to supercomputing in their pocket. This trend isn't going to happen all at once next year, but it will begin to accelerate, and it will transform politics and economics in really profound ways. Rocky Times For PC Manufacturers: Big, older, mainline PC manufacturers — especially ones with roots in the U.S. — are going to struggle mightily. In 2011, HP abandoned its own smartphone platform. And just a few weeks ago, Dell announced it was getting out of the smartphone business. These companies have cut themselves off from a huge part of where growth in computing is going to take place in the next few years. Breaking Out Of The Phone: We will see the emergence of devices that we didn't previously think of as computers having sophisticated computing and connectivity embedded in them. We are already seeing things like Google Glass. These "augmented reality" glasses will go on sale in 2013. They project data about your environment on lenses just a few inches from your eyes. There will be much more of that — connectivity embedded in more cars, glasses, watches and thermostats. Big Data: What will distinguish these new devices isn't going to be their design aesthetics but the idea that artificial intelligence will drive them to give users really contextually relevant information when they need it. So you are going to expect your smartphone to warn you about a traffic jam or your digital wallet to offer you really smart financial advice.